(PVP, expired in 2001) (Ontario x Suffolk Red). Bred at the University of Arkansas. The regular, heavy crops of this red seedless might make "Reliable" a better name. In Arkansas and the East Reliance has a unique fruity flavor. In the west, the flavor is usually less notable, but still sweet and pleasant. It certainly appeals to the animals as they go for Reliance before anything else in my vineyard. Ripening three to four weeks before Concord, Reliance is early enough to ripen well in a wide range of climates, and it has proven hard to at least -25ºF. Color varies from red to a rather light pink, depending on climate, and it may be edible even when it shows almost no color at all. Will crack if weather is rainy during ripening time. Reliance has one of the better vines, and it is easy to train to cordons with spurs. A sister seedling of Himrod (same parents) with seedless green to golden berries. Less vigorous than Himrod, but ripens about a week earlier and is much more productive, up to 30 pounds per vine. Good grape for cool climates or places with short seasons. Hardy to about -15oF. 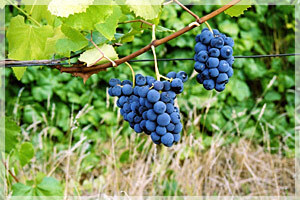 Berries are firm, develop good sugar around 22ºBrix on well-filled to compact clusters. 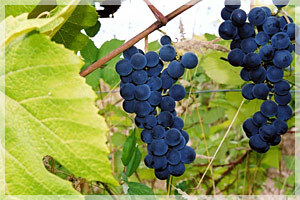 Interlaken is also the best variety I have tried for raisins and the berries make good frozen fruit. The vine produces well when trained to cordons with two or three bud spurs. (Alden x New York 46000) From the University of Arkansas. 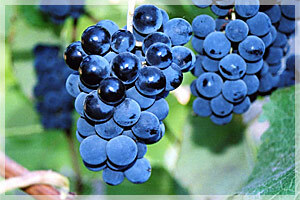 Venus is a black seedless that has unusually large berries for a seedless grape. It's flavor is a combination of muscat and labrusca. 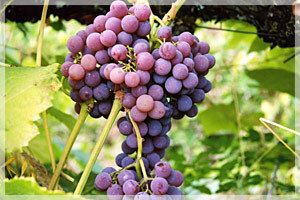 In some years the seeds may be full-sized, but are usually soft and can be eaten with the grape. Rarely, there will be a few hard seeds. In cool climates the skin may be astringent, but the flavor is good enough that most people overlook that. 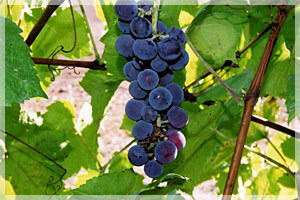 One grower with winemaking experience found that Venus had enough tannin that it might be useful in blending in wine. Venus can be spur pruned, but production and cluster size are slightly greater with cane training. Ripens about four weeks before Concord. Of complex parentage, bred by a private U.S. breeder in the 1880's. This black grape, with its big berries and big clusters has Concord-like flavor, but it's sweeter with less of the musky aftertaste of the older grape. While not commonly grown in the U.S., it is a favorite variety in Japan and other Asian countries. It achieves full color about a week before it is ready to eat. It is actually ripe two to three weeks before Concord in most areas. 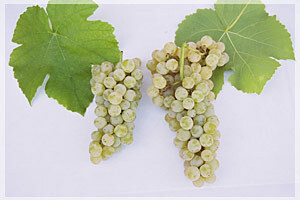 While most of the clusters are large, handsome, and well filled, it is a characteristic of the variety that there are always a few small, poorly filled clusters. Likes fertile soil or at least regular mulching with compost. About as hardy as Concord. Train it to cordons with spurs and prune the spurs to two buds. Hardiness and disease resistance is similar to Concord. A complex blue hybrid from VPI (Virginia Polytechnic Institute). For those who like Concord as a table grape, the flavor of Price is a refined version of Concord. The clusters are small, but the Concord-size berries have juicy, tender, very sweet flesh, and skin that is much more tender and less astringent than Concord. Where Concord has sugar of 16ºBrix, Price can achieve 22ºBrix.. Three clusters per shoot is not unusual, either. The vine is productive, with good vigor. It ripens very early, usually with the very first grapes in my collection, and is so well adapted to cool climates that it is one of the few grapes that will ripen around Puget Sound. This is my oldest son's favorite grape, and it's one that deserves trial for cool, short growing seasons everywhere. Reported hardy to -25ºF, with good general disease resistance. Proper Methods For Pruning Grapevines. Cuttings are available from mid-January until June, while supplies last. Vines have to go dormant before we can make cuttings. Most people order early for planting, but some people have started cuttings as late as August and held the potted vines over for planting the following spring. IT'S HERE!! The Grape Grower, by Lon J. Rombough, Chelsea Green publisher. Written from nearly 40 years personal experience, training in Viticulture at the University of California at Davis, plus years of growing and testing well over 200 varieties of grapes, and correspondence with other grape growers, researchers and breeders worldwide.